While not quite up to the standard we have come to expect from previous Cleek adventures, it is still quite a jolly romp, and Cleek's cockney sidekick Dollops is always good fun. . . .That man's nerves are like unstrung wires. Hardly ever seen a chap so frightened in all the course of my medical career. He's either had experience of the thing, or he knows something about it. Whichever way it is, he's the most terrified object I've ever laid eyes on!" Merriton broke into a laugh. But there was not much merriment in it, rather a note of uneasiness which made Tony West glance up at him sharply. 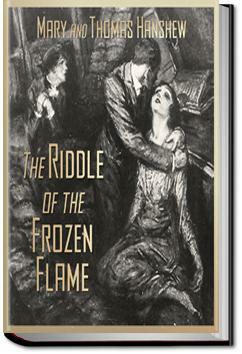 The Riddle of the Frozen Flame, this was great I enjoyed it, in some aspects it reminded me of The Hound of the Baskervilles. It kept drawing me back. If you like Sherlock Holmes you will love this book. Excellent reader, typical Cleek mystery. A very good mystery, though a bit lengthy. The style is mostly straightforward--readers are walked through the events as they unfold, learning what the detective learns, and are given a sporting chance at competing with the detective if they so chose, or to simply enjoy the mystery. Sort of a Hardy Boy's or Nancy Drew for adults mystery featuring mysterious lights, an old country manor, tall tales, whispered amongst the local country folk and a virtuous women defending her man from a series of flagrantly wicked accusations, not to mention a body or two.